In the current territory of web development, I Tech Zone offers software solutions, with Magento web development services. We have reached across and made a mark in a number of countries across the world with our Magento web development services. 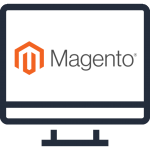 Our Magento developers have the evident experience and compatibility with Magento’s most up-to-date technology versions covering all your requirements. We built systems that enable business functionalities such as marketing and online promotions, product shipping, shopping cart solutions, seamless merchandising and execution of payment systems. We use this suitably to support your solutions, services and products over the web space. Being a custom Magento web development company, our services cover the performance of the numerous features of Magento to make sure business expansion of your online stores. We have managed to become the most favoured offshore platform to meet all the needs of Magento web and mobile development projects. We cover Magento website development, module building, custom E-commerce solutions, theme development, shopping cart solutions, support, maintenance and extension development solutions. We render seamless navigation making it easier for your customers to reach out their desired products. Supple payment gateway integrations and connecting social media portals with your website developed in Magento is another benefit with our services.